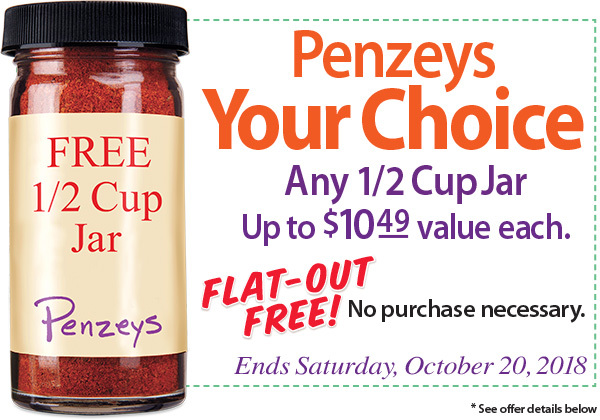 Limit ONE free Penzeys Your Choice 1/2 Cup Jars, maximum value $10.49 each, per household during run of promotion. No purchase required. Not applicable to prior sales, not valid with other offers. While supplies last. Coupon must be presented at time of purchase. Online, visit www.penzeys.com, promotion will automatically be applied at checkout. Standard shipping rates apply. Offer ends midnight Saturday, October 20, 2018.